I have always prayed about going on a mission trip for years, but nothing ever brought an answer. The thought of going to a different country to help others always brought joy to my heart. On June 3rd, my prayer had finally been answered. It was just a normal day for me, getting ready for church, getting there and sitting with the people that I normally sit with. After service, they were talking about how they were behind on fundraising for a mission trip coming up. Then, they asked me if I wanted to come. They told me that the last day to sign up was in 3 days. As soon as they asked, I said yes. I was not hesitant and I just felt like this was the right time to go. My friends exchanged the information that I needed to order my passport and apply for my spot to the Dominican Republic. As soon as I left the service, I went to CVS to get my passport picture taken and as soon as I got home, I applied on the SERV website. I was so excited and ready for this experience that I had been waiting for all my life. The month passed and it was almost time for the trip. I had some more fundraising to do, but I was not worried because I knew God wanted me to be on this trip. The days before the trip were flying by. I had packed a month in advance and when the day was upon me, the feelings rushed. Arriving at the airport, knowing this was a lot of firsts for me, my first mission trip, my first time going out of the country, my first time on an airplane. I was a bit nervous but I was ready. The flight was fun and amusing. Seeing how small the cars and houses were. The beautiful clouds and oceans. The 3-hour flight went by and we arrived in Santo Domingo. As we were landing, I could see the baby blue ocean some ways away and I could also see the little shacks that were houses to some of the people in the DR. It was such a fascinating view to literally see the struggle before landing. Getting off the airplane and into the airport, it was so different from America. Being my first time ever out of the country, it was so amusing just looking around, seeing the signs and posters all in Spanish, not knowing what they said at all. Hearing the Dominicans and Haitians speak Spanish was oddly soothing to listen to. Meeting the pastor and his wife there, our mission had begun. Arriving at the church with a sign at the top of the church doors saying “Bienvenidos,” I met the most amazing people. The church members along with some great kids. We all clicked instantly. For our first day at the church, I got to help prepare the food for lunch. I had so much fun, listening to them chat while the kids were teaching me Spanish. The food was ready and we all ate together, feeling like one big happy family. After setting up for VBS, we all did door-to-door ministry and I was amazed. Just the way I felt about going to the houses and just praying over them, and blessing their houses just gave me so much joy. 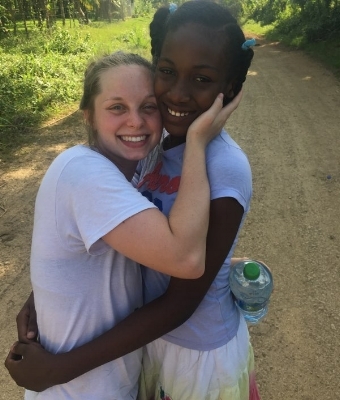 I had never experienced that, and as soon as we were done praying for the first person in the village, that’s when I knew I wanted to do missions for the rest of my life. The next morning, we got to go to another village and do door-to-door ministry again. To see the hard struggle of some of these families really broke my heart. Things such as a woman being blind, an eldered man getting hit by a motorcycle and almost dying, or a woman having a brain disorder where she thought she was still a child. Fortunately, we got to give the blind woman our first water filter and some bags of food. She was very appreciative and such a blessing to meet. Meeting other families, we got to get the chance to bless them before we left as well. We left, leaving our blessings and prayers to that village. Arriving back at the church, we started getting ready for the first night of VBS. The kids started arriving and we got to play with most of them. The VBS went great and I really got to meet such loving and selfless kids. I was in paradise. I never thought that these kids would bring so much joy to my life! I will never forget all the precious souls that I got to meet. On one of the days, we got to rest and go to Santo Domingo and shop for souvenirs and enjoy our time at one of the most beautiful beaches in the world. While shopping, I noticed a simple bracelet that was left on a necklace shelf. Not knowing what it said, I just picked it up and the feeling of God rushed me. On the bracelet it said, “Mission Trip DR.” I was so astounded and I just had to buy it as soon as possible. I showed everyone and we looked everywhere for others so the whole team could get one, but there was only one. I felt like God wanted me to have it. Even though it was something so little, I saw God in the situation and it was awesome. Being done with shopping, we made our way to the beach. I had never seen such clear water before. It was beautiful. Watching all the Dominican people walk back and forth, selling souvenirs and food to tourists, knowing that it was their job and that’s how they make a living. It was a humbling experience for sure. As we left the beach and got to the hotel, I was not prepared for the next day as it was the last day of VBS. VBS started and I did not want it to end. I tried to play with each and every kid before we said our goodbyes. Unfortunately, I was not able to say goodbye to some of them due to me having a break down. As I was watching all of the kids eat their snack after VBS, I noticed that even though these kids literally have nothing else to give except their love and presence, I saw them share the last of their bread and the last of their juice, even though they wanted it more. They thought of so many others before themselves and that’s when it hit me. I had to get up and remove myself before any of them noticed me crying. It hit my heart so bad. Just knowing how genuine and how loving these kids were just made me want to stay in the DR forever. I will never forget the feeling of my breakdown and I will always remember all of the genuine hearts these kids have. “The Dump” gave me chills. The kids gave me grief. The experience of being there gave me humbleness. Arriving at The Dump, it was actually cool to me how many weird looks we all got because of the color of our skin. Some of these people had never seen a white person before in their life. Before doing door-to-door missions, the team told me to be careful with these kids, but why? These kids live in their own trash and The Dump has many diseases. I was not able to hold, to love up on, or to kiss on any of these kids how I wanted to because of how they lived. It broke my heart and I just felt so much hurt for these kids. The Dump is all that they know. The village they call a home where they live in trash and filth. The thing that got to me the most were the kids begging for the food we had. Tugging on our arms, begging us to come bring the food to their families. Kids the ages of two to about fourteen or fifteen, begging because of their own starvation. It brought literal sickness to my stomach. I am forever going to remember The Dump and to always be grateful for what I have and where I live. The last day being in the Dominican brought so much tears. I did not want to leave my second family. I did not want to go back home to America where the people are needy in a way that is so demanding. I did not want to leave such sweet souls and my true happiness. While giving out notes to some of the kids that meant the most to me saying “I will love you forever. You will always be in my heart,” and instantly getting a note back from one of them and it said “You were the best missionary I have ever met. You were happy, affectionate and I want you to come back soon. In the days that you have been here at the church, you were always happy every time. You would kiss me and I thank you. I love you so much and I hope you come back soon. I love you.” I am enough for these kids. I am enough for this church and these church members. I am enough for this country. After exchanging notes, I gave the two girls some of my belongings that meant a lot to me so they could keep forever. The church service started and we began to pray on our knees about everything. The community of the Dominican, the health of the church members, the starving kids in the world, the safety for the SERV team, and a lot of other things. We sang songs with them and we even got to sing a song for them as well. The pastor gave such an amazing message in the speech and his wife had something amazing to say specifically for me. I had no idea I needed this woman in my life more than I have ever needed anything. While speaking in Spanish, I paid attention to her but I obviously had no idea what she was saying, but when she was done, I definitely felt God as she came to hug me. I was confused as to why she was only coming to hug me and no one else. I didn’t know what she said but when she hugged me, I knew it was from God. I cried as she cried and we exchanged I love you’s. After, I looked in the church and I noticed the lives that I touched. I noticed how bug of an impact I really was on this trip even though during the whole thing I felt like I wasn’t doing enough. Just by being myself and doing what I do every day, it touched so many people and I finally realized that I am enough. I am worthy. I am loving. I am Godly. I am important. I am contagious. I AM LOVED. I am loved by so so so many. When the service was over, her daughter translated what her mother had said about me and it was that When I came to the church, God told her that I was very special. God told her that I was struggling at home and she said that I needed to trust in Him and know that God will always be with me and that she loves me very much. Also, when I head back to America, that I should always remember that someone from this church will always be praying for me, especially her. I can’t really explain the feeling that this gave me but all I know is, God is good all the time. All the time, God is good. I am at loss for words how amazing God is. To speak to someone else that I barely know, when he KNEW that I was struggling with many things, to let her speak through Himself really just amazes me to the point where I simply can not speak. I experienced God’s presence through miss Rafaella. I felt God in her. I feel God because of her, and I could not thank God enough for ALWAYS showing me how faithful and loving He is to us.